Researchers at The University of Toledo have developed a highly accurate method to test for microcystin in blood or urine samples, an advancement that could provide clinicians a powerful new tool in assessing a patient’s exposure to the dangerous toxin. The discovery is a continuation of the work UToledo has done around harmful algal blooms since the 2014 Toledo water crisis that temporarily left the city without drinkable water. 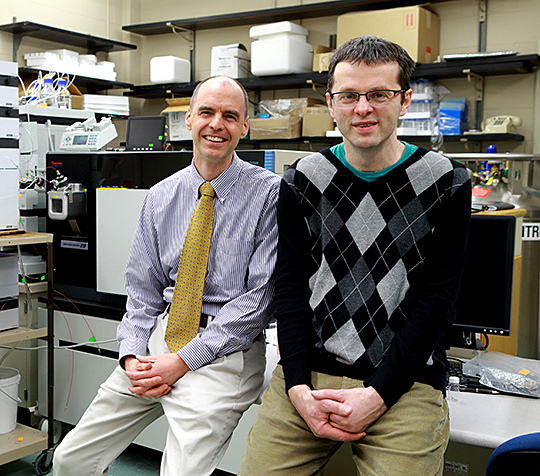 Dr. David Kennedy, left, and Dr. Dragan Isailovic have developed a test for microcystin in blood or urine samples that could prove to be a powerful new tool to assess a patient’s exposure to the toxin. Kennedy’s lab collaborated with Dr. Dragan Isailovic, associate professor of chemistry in the College of Natural Sciences and Mathematics, and Dr. Steven Haller, assistant professor of medicine, to develop and test the method. The research was funded from grants awarded from the Ohio Department of Higher Education’s Harmful Algal Bloom Research Initiative. UToledo’s microcystin test combines a method for separating the toxic compounds out of blood or urine samples by liquid chromatography with further examination using mass spectrometry. The test can identify various microcystins and quantify concentrations of six common microcystins, including the types most often found in Lake Erie. “Together, we have created a reliable tool that hasn’t existed before. From a clinician’s point of view, you can’t underestimate the importance of having certitude in your diagnosis. We’re helping to provide new diagnostic methods for clinicians to rule in or rule out exposure to microcystin,” Haller said. Most other attempts at testing blood or urine samples for microcystin have relied on the ELISA test, which is the standard method for quantifying microcystins in water but isn’t as effective in biological samples. The findings were published in the Journal of Chromatography A. Other UToledo contributors on the paper were Dr. Dilrukshika S.W. Palagama, David Baliu-Rodriguez, Apurva Lad and Dr. Bruce S. Levison. A provisional patent on the testing method has been filed. The researchers are exploring opportunities to use the lab’s technology to offer testing of samples to outside entities. This entry was posted on Friday, April 12th, 2019 at 3:01 am and is filed under Medicine and Life Sciences, Natural Sciences and Mathematics, News, Research, UToday .